The MGB GT was a hardtop version of the iconic MGB roadster and was produced with only minor changes from 1965 through 1980. The long life cycle can be attributed to the inherent goodness of the car and the dogged determination of the inhabitants of that dreary island -- if it was good last year, it'll be good again next year (see Austin Mini for reference). This is an early MGB GT, which means it has attractive early chrome bumpers and a reasonable ride height, plus it is blue (which we already know is the best color for cars). Find this 1966 MG MGB GT found here on eBay offered for $13,900 buy-it-now or make-offer, located in Cashiers, NC. Over 125,000 of the Pininfarina designed hatchbacks were built and sold around the world, and prices are generally favorable for the buyer. This example is current offered on the high end of the MGB GT price scale, and you could save almost 10 grand by picking up one that isn't so shiny, like this one . Power in 1966 came from a 1.8 liter OHV inline-4 rated at 91 horsepower and 98 ft-lbs of torque. The hardtop GT version was marginally heavier than the convertible MGB, but stiffer torsional rigidity will make it nicer in the turns. I saw one of these same color driving down a mountain road near Los Angeles about 3 weeks ago. 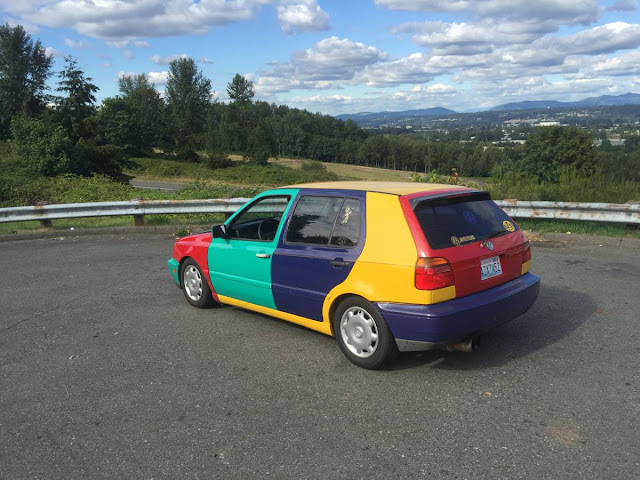 Neat cars, but the seller doesn't know the market, this is a $6k car max. I saw one on the central jersey CL about 2 months ago that was $2500, same color and condition. I should have pulled the trigger. Hagerty's valuation guide lists a #3 '66 MGB-GT @ $7,600 and a #2 @ $16,000, so I'd think 6K would be a bit low. This car is probably somewhere between a #3 and #2, probably a 10K-ish car. I struggle with the value of old cars nowadays since the Fed has debased the dollar with QE and QE2. Hagerty is wrong as usual. In 2013 I bought a 71 Volvo 1800E in condition 3 for $5000. Hagerty said it was worth $12,400. I then sold it last year on ebay for $7800 and it was close to condition 2 when I was done. The car was beautiful. Hagerty said it was worth $18,300. In 2012 I picked up a 1967 Alfa GTV 1600 for $7,000. Hagerty has that car valued at $20,000. They are way off. I am a Hagerty policy holder too. I too am a Hagerty policy holder on the '72 240z. I paid less than $5k for the car and have put under $500 in parts into it over the past 3000 miles. Hagerty values it at $12500 in condition 3, which it is currently in according to the adjuster who reviewed my photos. If someone offered me $7k for the car I would take it and run like hell. TL;DR Hagerty is on the high side of actual market values in my anecdotal experience. YMMV. They will get their price...this is a great 2owner and being the best year in near original not rusty condition makes it a driver that you won't loose a penny on. No you aren't stealing it, but try to find another 67 in this original condition let alone for less money. Budget $1500 to redo seats. No overdrive that's another $1500...two owners, good! The cheaper one you linked looks good, esp with the Minilites. The cheaper one states no rust, but later where the bondo is...so you are already replacing rockers and who knows what else which then leads to at least the price of this nicely done and documented solid car.